I have been keeping from posting this drawing for some time now. A very good friend of mine, (check out her amazing knitting blog! ) and I decided we’d enjoy doing an art swap. So we both did an artwork in secret and then exchanged the drawings by mail. We then had a Skype chat so we could exchange them face-to-face, as we live a long way from each other. What fun that was! 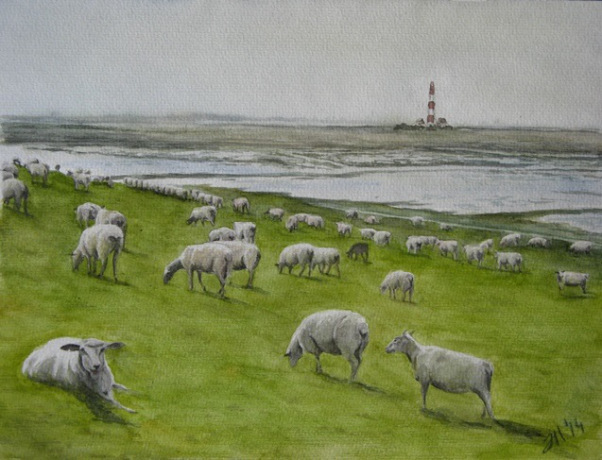 Jana kindly gave me permission to post her wonderful painting, so I’m going to do it so you all can see how great it is! Isn’t it just beautiful? It’s so serene and peaceful. The colors are even more vibrant in real life. Here is what I did for the swap. My friend, I think, likes this drawing so I am very glad for that. It was such a fun swap! – The drawing is 5×7 inches and drawn on Strathmore gray tinted Pastel Paper, if I recall correctly. – I used Faber-Castell Pitt Artist pens for this, mainly the brush tip size of various grays and blacks. 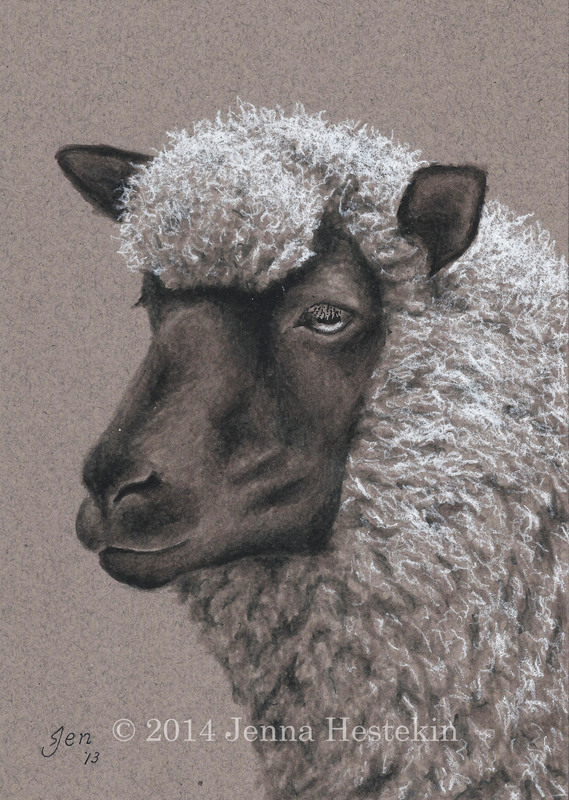 For the wool, I made some vague, light colored marks with my pen and then finished it by using a very sharp white charcoal pencil to pull off the fuzzy, abstract look of the sheep’s wool. Hi Jenna, you are very welcome! 🙂 I think I made a great deal. 🙂 Thanks for that super cute sheep with that extremely fluffy fur. I love it. Yes, we both won. 🙂 You are welcome to show my painting, I´d be honored. It was a great deal of fun, wasn´t it? and how you could perfectly render the perception of thickness. It’s a wonderful drawing !